Earlier this year at one of our PLN get togethers, we talked about a behaviour management technique found on Pinterest. I refer to it in my classroom as the nakal/pandai (naughty/clever) system. Read here for a quick refresher! It has been such a success in my classroom with younger students that I want to post about the way in which it works for me. 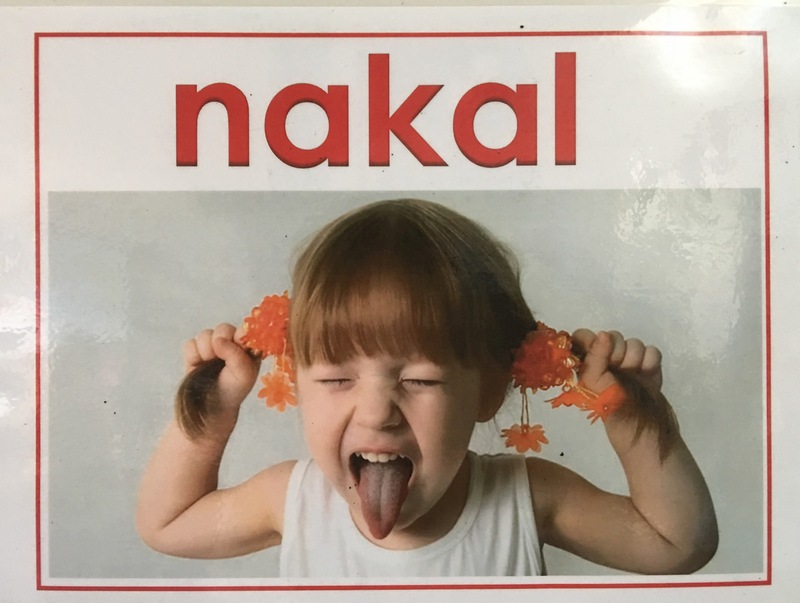 Here is how I use the nakal/pandai system in my lessons with my R-2’s. The students walk in the door and sit down immediately in front of the white board. Students who do this quickly and quietly, receive immediate positive feedback with a smile and a verbal compliment, “pandai’. 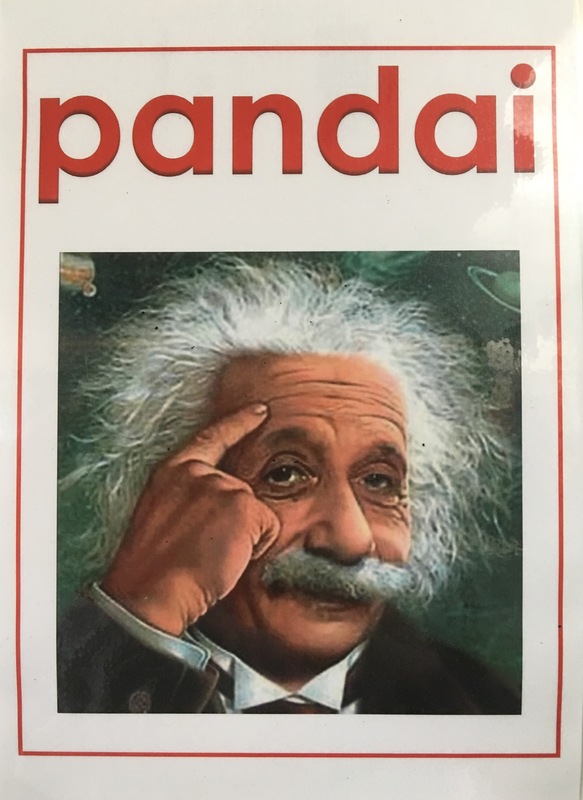 I then point at the pandai sign, look back at the student, smile again and then add a tally point. I then turn back to the class and give a thumbs up sign to the student before stating to the class, “Jack pandai! Bu Cathy kasih kelas Warner satu poin! Bagus Jack” (Jack is Clever! Bu Cathy has given your class a point. Well done Jack) If anyone does the wrong thing ( rolls on the floor, starts chatting in English to a friend etc), I look at them with a sad face and then do the nakal finger shaking gesture and turn around and tally a nakal point. The beauty of this, is that everyone knows exactly what the problem is and no English is necessary. I used to rely on English to get explain this, but it is no longer necessary! 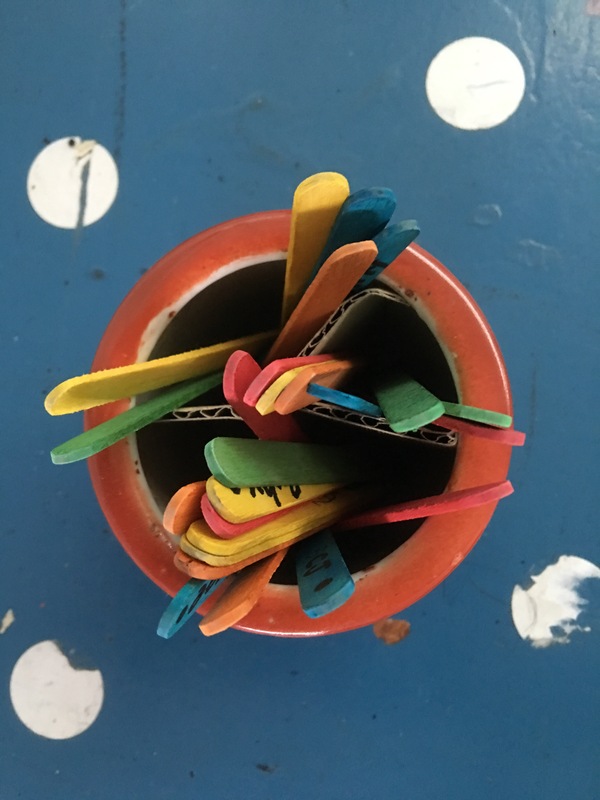 After calling the roll on class dojo in Indonesian (Bu Cathy mengabsen), I turn to the class and say, “Bu Cathy mau satu stik!” I hold up their class pot of paddle pop sticks (huge shout out to Natalie Bond for writing the names of all our students on the sticks for me!) and ‘randomly’ choose a stick, looking at the name to check that firstly the student is here today and secondly that they haven’t yet had a turn – each stick is marked afterwards with a dot. I then put the stick in the blutack between the nakal/pandai signs, name side downwards so no one knows whose stick it is. Students have quickly learned the colour of their own stick which is something I will avoid next year by allotting a different colour to different classes. 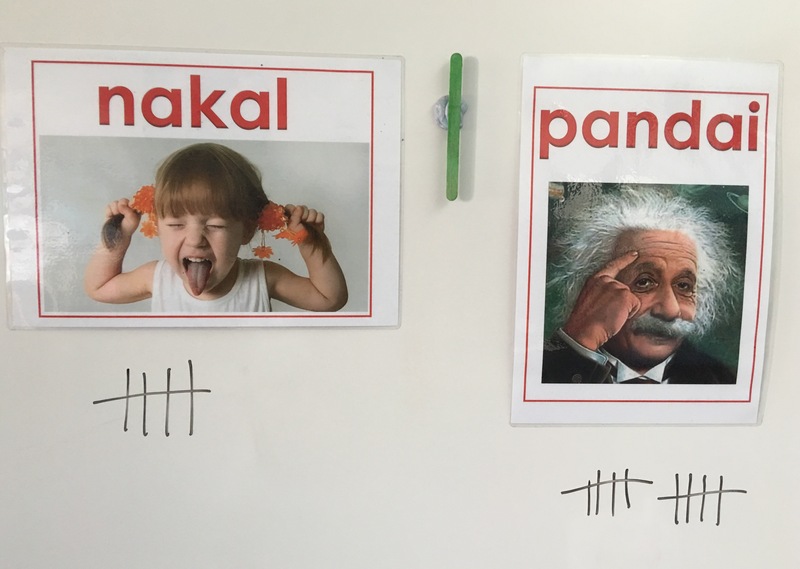 Throughout the lesson, I tally whenever students demonstrate successful learning behaviours (pandai) or behaviours that interfere with thir own learning or the learning of others (nakal). The students watch this avidly and cheer when a single tally changes the balance from nakal to pandai!! While she is looking in the treasure box (Is there a simple catchy Indonesian word for this? 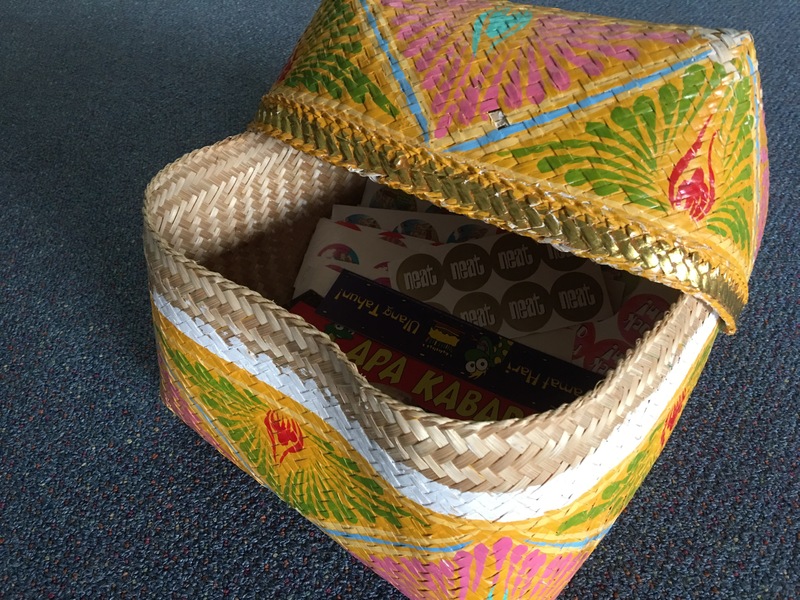 ), the class sing the goodbye song which is generally enough time for ‘Lisa’ to choose something from the treasure box, put the lid back on and then rejoin the class in time to line up ready to leave with the class teacher. Another added bonus of this system has been student acquisition of numbers! It has been a successful and meaningful way in which to introduce and consolidate knowledge of numbers 1 – 20 and without a doubt, my receptions this year have the best grasp of numbers than any other previous cohort! Do you have a behaviour management system that works for you? Please feel free to share below by adding a comment!! I use Ibu Cathy’s system just as she discussed and it is one of my favourite ‘activities’. The students adore it! I have 22 classes, so it is impractical to use names. I number the sticks, and also have them all in the same colour (too many smarty pants were saying, oh, it’s not me after they had had their turn). All my class lists are numbered. So we just look at the number, then I look at the class list to see who it is. Works fine! Thanks so much for your comment. Ibu Sharon too uses this system and has tweaked it to fit her classroom/school context. Love your class!! They are a delight to teach!! I learnt the word for treasure chest the other day! Peti harta karun! Not sure if I would call that catchy but all good words to learn! Not catchy at all and no cognates! Boo hoo. We need to come up with a phrase for the treasure box that incorporates familiar or useful language!! Any ideas?